Geneva February 14, 2006; The 2006 Geneva Motor Show plays host to two completely different show cars from Nissan… but they share one common theme: accessibility. Whether it’s negotiating the crowded city or exploring the wild, Nissan’s cars of the future promise to SHIFT_access. At first glance, Nissan’s two show cars for Geneva couldn’t be more dissimilar. One is a diminutive yet innovative electric city car, the other a substantial four-wheel drive explorer. Yet the city-orientated Pivo and the go-anywhere Terranaut are linked by far more than the Nissan badges on their noses. To the team of designers and planners who conceived it, both the metropolis and the most remote, unconquered areas of the globe are "fields for human adventures". Although produced for two diametrically opposed habitats and physically at either extreme of car design boundaries, Pivo and Terranaut share some key elements: both, for example, have three seats and both feature rotating spherical ‘pods’ as a central part of their respective overall designs. But, above all, both have been created to enhance mankind’s relationship with the world. Terranaut Terranaut shows how cars of the future could interact with the world in which we live. As imposing as Pivo is small, Terranaut is a manned, mobile science laboratory – earth’s equivalent of a lunar rover. "The Terranaut will protect its occupants from the extremes of the world’s environments and, on the other hand, allow you to be part of it." François Bancon, General Manager, Motor-Show, Exploratory & Advanced Product Planning, Nissan Motor Limited. Measuring 4,965mm from stem to stern, the advanced four-wheel drive explorer stands 2,150mm tall and is 2,100mm wide. These impressive external dimensions provide Terranaut with the interior space needed to house its laboratory equipment and scientist. 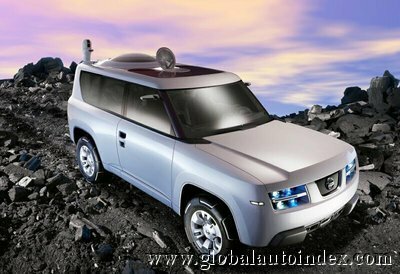 A creation of London-based Nissan Design Europe, the overriding theme behind the concept is one of function. Project leader Felipe Roo Clefas, Assistant Chief Designer, NDE, says: "Terranaut has been designed for observation and communication in all four corners of the world." Terranaut is very much a statement about how the 4x4 can help us discover more about our world. Capable of being driven deep into the Outback, to the middle of the desert or to the frozen wastes of the tundra, Terranaut is an observation and communications centre as well as being a mobile science lab. Satellite information systems allow data access and transfer all over the planet. Built to house three operators – a pilot, co-pilot and lab technician/scientist – Terranaut has enough refrigerated storage space to house food, water and other provisions for stays of upwards of a week out in the field. Lightweight tents, sleeping bags built for extreme conditions and simple cooking facilities are carried in storage compartments in the doors. To accommodate the laboratory area within the cabin, the co-pilot’s side of the car has just one door, while the other side has a pair of swing doors and no central B-pillar. By hinging the doors at the front and rear respectively, ingress and egress is made easy: an important consideration when the occupants are likely to be wearing many layers of protective clothing. With both doors open, virtually the entire side of the car becomes an entrance to the cabin while a step built in to the substantial sill folds down to ease access still further. There’s no conventional door at the back of Terranaut, either. Instead, centrally placed in the rear is an integrated air lock drawer into which the pilot or co-pilot outside the vehicle can place samples for clinical analysis by the scientist left inside the cabin. As well as providing excellent visibility out of the vehicle, the deep rear window also houses external displays and touch screens for data access by those outside the vehicle. Excellent all-round visibility is also afforded by the deep side and front windows, while much of the roof area above the two front seats is glazed, too. All the glass is highly reflective thus maintaining a controlled atmosphere within the cabin by reflecting external light sources, whether it be from the sun or glare from snow and ice. Huge wheels are covered by tyres specially constructed for Terranaut by Goodyear. Puncture proof, they function as conventional road tyres when the vehicle is being driven on metalled roads but, by changing air pressure, transform themselves into chunky off-road tyres. The exterior of Terranaut is dominated, however, by a glass dome over the rear portion of the roof and which marks the uppermost element of Terranaut’s science laboratory. As well as providing a window on the world for the occupants inside, the sphere doubles as an escape hatch should the ground beneath the vehicle give way for any reason. Other features to be found on the roof are a circular housing for satellite positioning, transmitting and scanning equipment and a telescopic arm onto which a day/night view camera can be mounted. When fully extended this can transmit 360-degree ‘helicopter view’ images from around Terranaut to the vehicle itself and to expedition headquarters at all hours of the night and day. 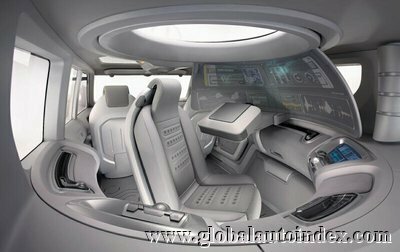 Inside the vehicle, the spherical science laboratory dominates the entire cabin area behind the two front seats. A single revolving seat with an integrated computer keyboard is situated beneath the glass roof dome and gives the scientist complete 360-degree access to the various workstations found in Terranaut. The laboratory also incorporates a hemispherical display in front of the revolving seat which acts as a computer screen and data display panel – created in collaboration with Elumens – and onto which can also be relayed images transmitted from the cameras attached to the vehicle. Images and data can be downloaded to both computer storage systems and to an on-board high definition printer. Although designed as a mobile laboratory, NDE’s project team of six designers has ensured the vehicle provides a welcoming habitat for the three-man Terranaut team. While functional materials have been used extensively inside the cabin – the totally flat floor, for example, has an easy-to-clean rubberised covering – all surfaces with which the occupants are likely to come into contact feature soft-touch materials. Touch pads used to open the doors electrically are covered with a tactile silicon finish while the seats, which all feature air vents in the base and backrests feature ‘breathing’ fabrics. Colours chosen mix practical laboratory greys with warm beige and brown shades to bring a human touch to what is essentially a scientific environment. Reflecting the sorts of samples that might be brought into the laboratory for analysis, the design team have adopted the hexagon – the geometric shape of one of the seven crystal systems – as a styling feature. The light clusters, front and rear, are all hexagonal while the jewel-like lights themselves appear to be actual gemstones. Raised hexagonal sections on the flooring provide extra grip inside the cabin, while even the two sides of the dashboard and the centre console between pilot and co-pilot adopt the six-sided theme. We would like to thank the following supplier companies: Seiren, Vimo, Textile Bounding, Alveo, Trêves, Guilford, Technicoat and BASF. 2006-02-14 Please quote Global Auto Index if You use this news article!